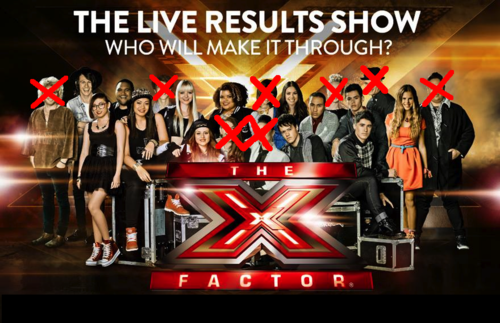 Tonight on X Factor NZ, ADIOS AMIGOS! June 24, 2013 January 18, 2016 JawkwardLOL2 Comments on Tonight on X Factor NZ, ADIOS AMIGOS! Mean performances from Dane Rumble and the Jupiter Project and Reece Mastin, have to say that these were probably the best non-contestant performances we’ve had all season. Props to Reece’s stage people, his set up was pretty cool. Gap 5, who I was sure would be going home today, were the first to be told they were saved. Followed by Whenua, of-course, Cassie and Moorehouse (leaving a very ecstatic Mel Blatt). Finally, It came down to Jackie, Benny or Tom before Dominic Bowden left us on a cliffhanger and sending us into an ad-break before we got to find out that Jackie was safe. Tom went back to his audition days for his survival song, something rockish and raw. Benny went vulnerable with a stripped down acoustic version of Can’t Help Falling In Love. Twitter was torn, who did they hate more? People were calling for Tom’s scruffy head on a platter and some were calling for Benny to be ironically killed off, Hunger Games style. However it was up to the judges, and if they went two a piece it would be down to deadlock- meaning whoever had the lowest votes were out. However because Ruby abstained from voting, taking a page out of Mel B’s page from that time Mel had to choose between L.O.V.E and Moorhouse and refused to participate, deadlock was taken away. So with Mel choosing to vote Benny off and Stan and Dan both deciding to go the other way- we farewell Tom. – What will become of TomJack? JackTom? Tommie Jachelor? Okay I’ll stop. – Daniel wore a kilt and Dominic made it awkward for everyone when he said he hoped that Dan was wearing underpants. – Next week we get songs made in America. ‘MURICA! Next JawkwardLOL’s Compendium of Tillyisms!